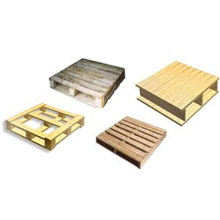 We present an economical range of Wooden Pallets for Shipping Industry. We have wisely made these wooden pallets keeping in mind the aspect of space limitation in shipping. Thus, these pallets are easy to stack and lift. These are easy to handle, lift and move while shipping goods. Our all the wooden pallets are heat treated and ensure protection to goods from external elements such as rain, water and dust that can hamper their quality. The design of the pallet ensures even load distribution and no damage to goods and thus ideal for heavy duty machines and equipments. The raw wood is first heat treated before use in making pallet thereby protecting it from termites and other pests. We are fully equipped for producing minimum order quantity of 500 pieces in stipulated time period. These pallets can be customized according to clients’ requirements.